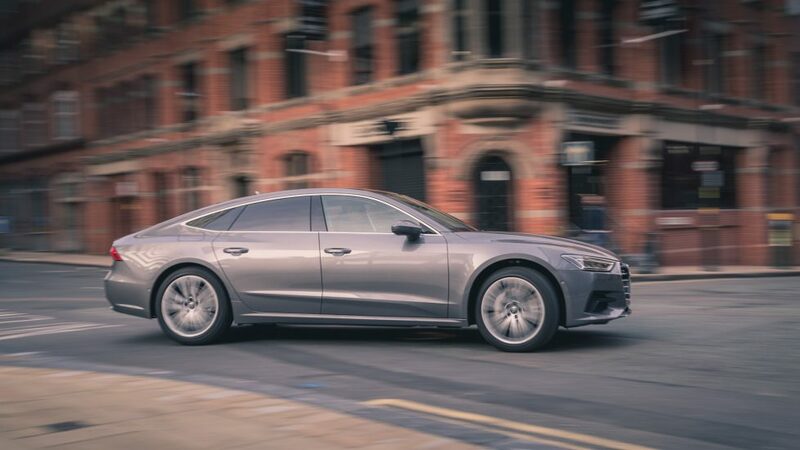 We’ve had a test of the latest 2018 Audi A7 Sportback 55 TFSI, and it is a proper techno-fest. Here’s our take on it. 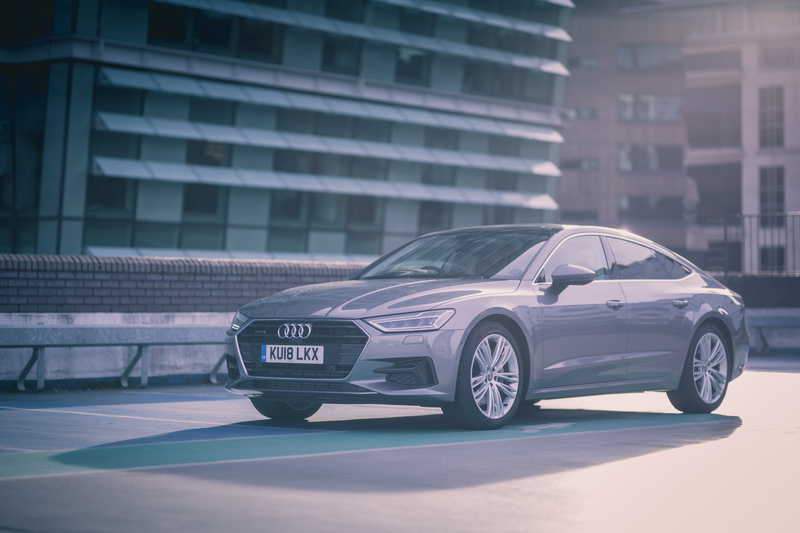 What is the 2018 Audi A7 Sportback all about? 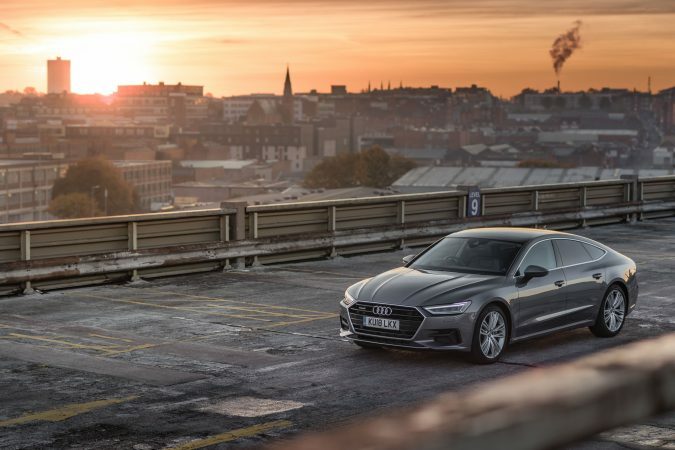 The 2018 Audi A7 Sportback has always been quite unique. 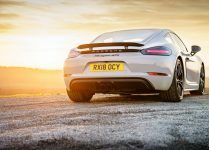 Offering boot space comparable to most family hatchbacks in a luxurious German coupe, the latest iteration does look properly appealing. That said, while it does boast massive estate like boot space in a very sleek body, you’re certainly paying for it. Is it all about style in motion, or is it something that you’ll actually want to own? 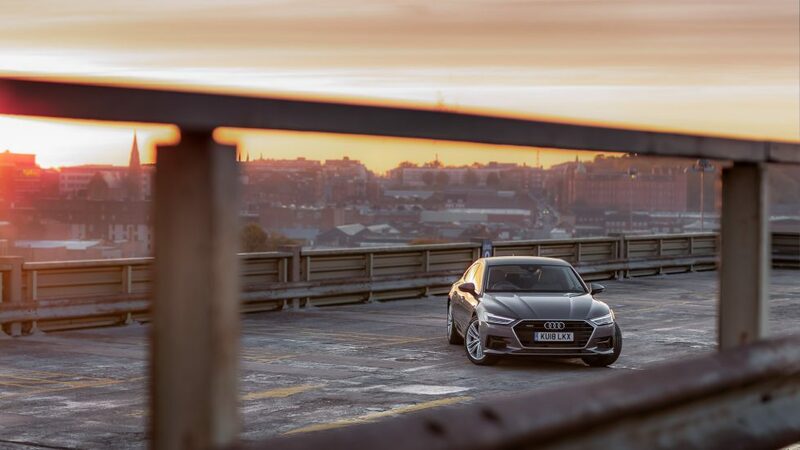 Aesthetically speaking, the Audi shape – its lines and contours – are eminent and seductive. 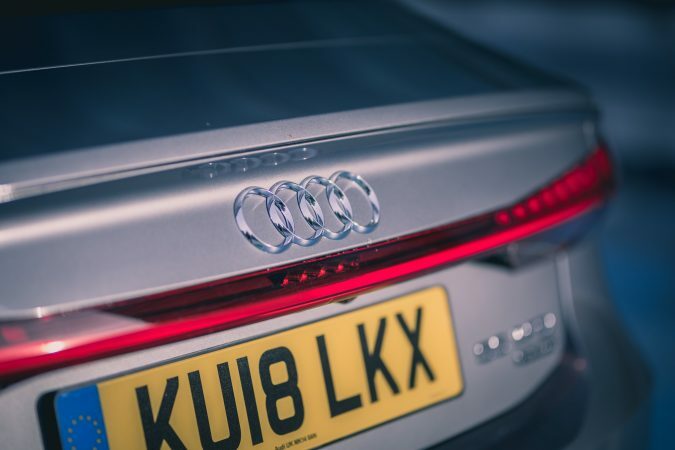 Boasting a svelte coupe body line, the Audi A7 Sportback features clean, crisp and defined lines that pleasingly complements the sharp Audi design. 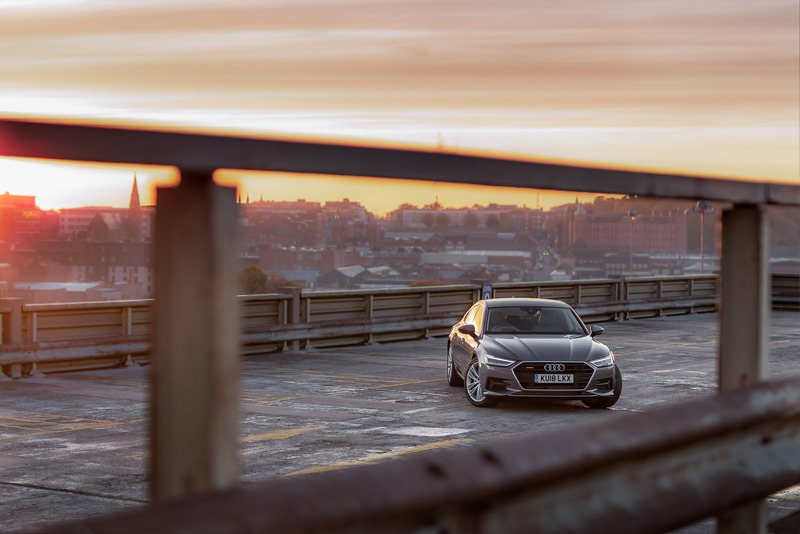 With regards to the design and implementation of exterior lighting, Audi is firmly ahead of the pack. 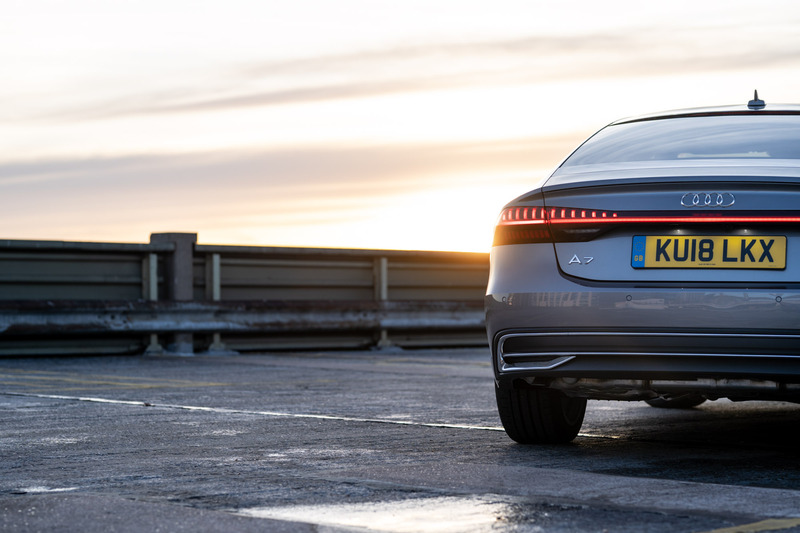 Both front and rear lamps feature matrix LEDs with dynamic signal indicators, whilst the distinctive mono-piece taillights look as though they were lifted straight out of a concept drawing. 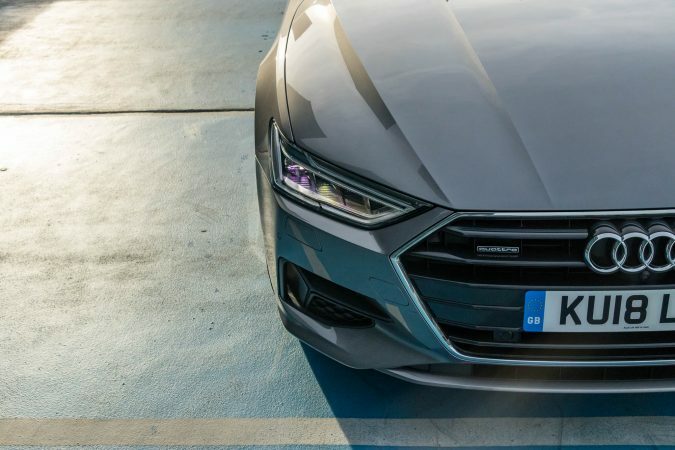 Inevitably, the front of the A7 proudly bears the giant Audi grille – ours featuring aggressive side grilles in lieu of the large, single piece lower apron grille found in the higher S Line trim. 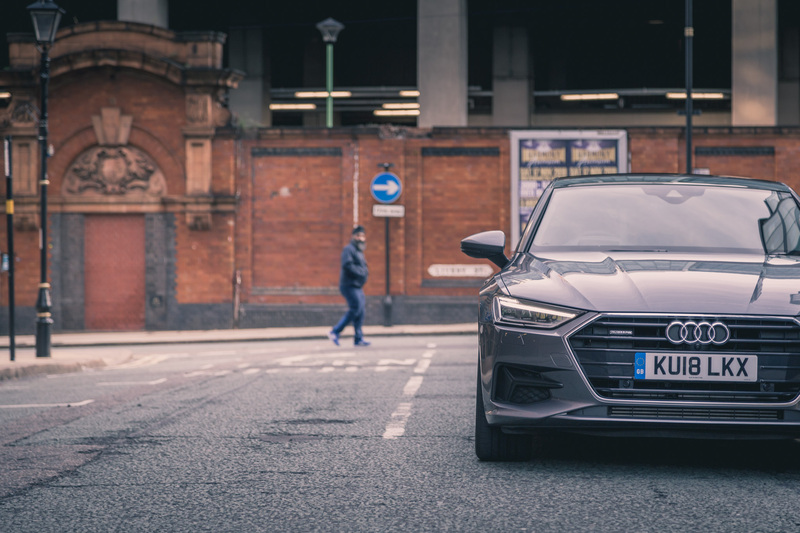 Sitting on optional £900 20″ 5-twin spoke alloys and painted in £685 metallic ‘Typhoon Grey’, our A7 Sportback certainly looks the business parked against the gritty backdrop of a central business district. I found the rear angle to be the most fascinating, it’s definitely a departure from a typically conservative company. 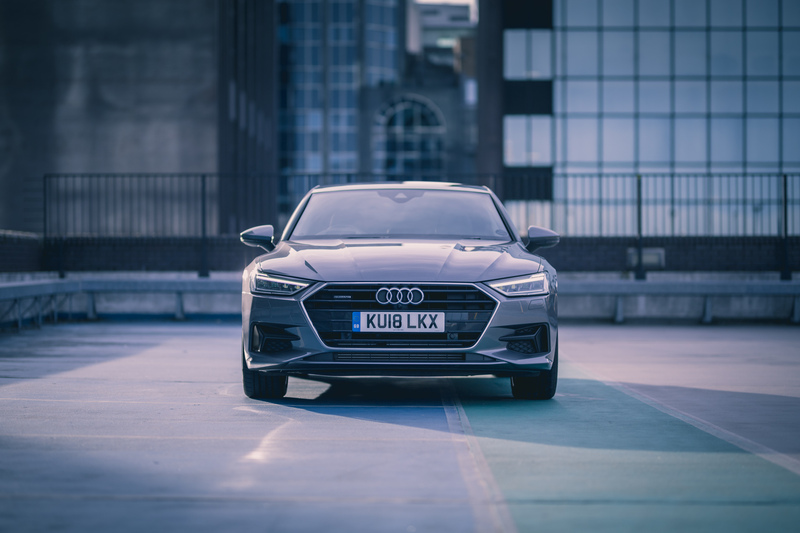 Powering this massive coupe-saloon is a 3.0-litre ’55 TFSI’ twin-turbocharged V6 petrol engine that touts 340 PS and a shocking 620 Nm of torque. 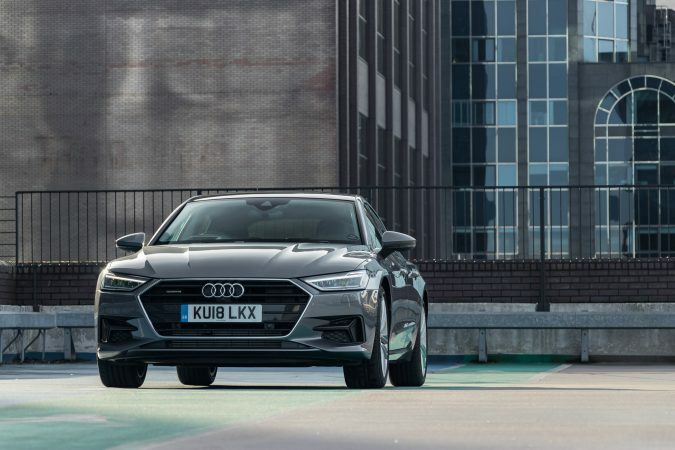 It is the most powerful petrol engine you can select in the A7 Sportback, and it is what you’ll want instead of the diesel options. 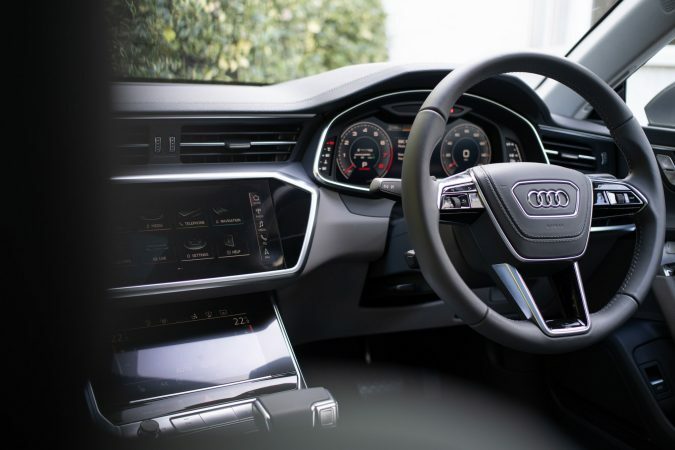 Choosing the brawny 55 TFSI engine means that all that power is handled through a 7-speed dual clutch S tronic transmission. 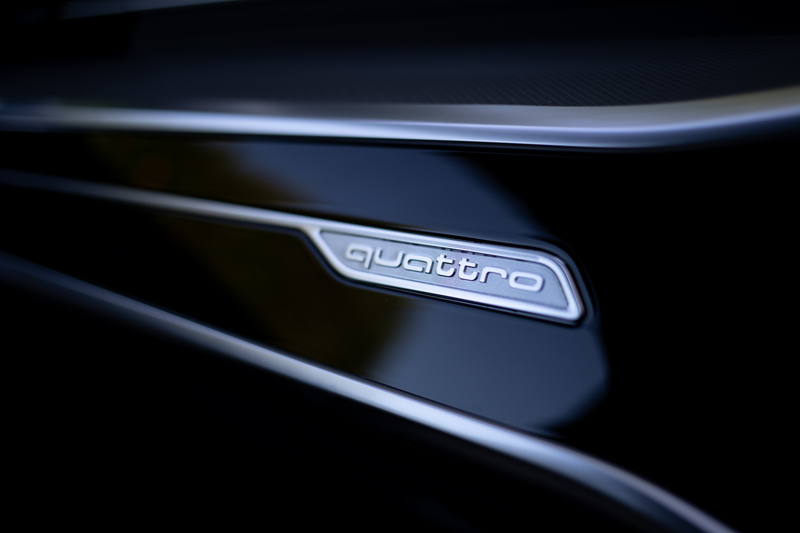 Power is then delivered to all four wheels through Audi’s Quattro all-wheel-drive system that’s standard on all but the 40 TDI engine. 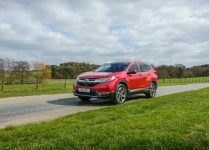 While it is a properly powerful unit, you may be surprised to learn that it reportedly returns 40.4 mpg combined while putting out 161 g/km of CO2. 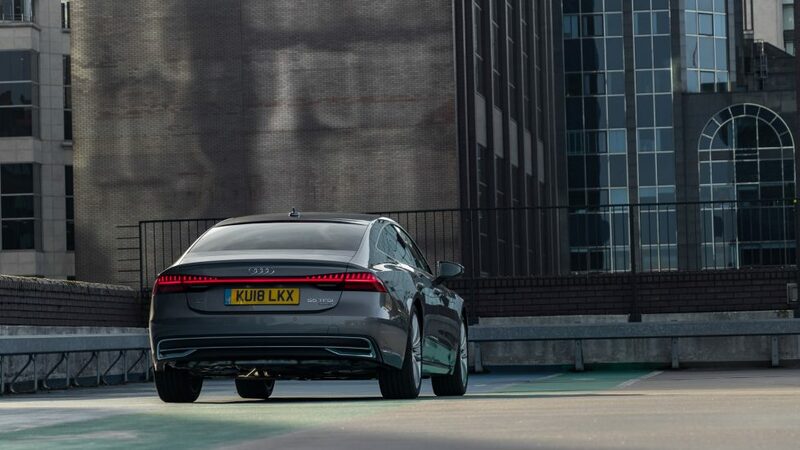 During our tests, the A7 Sportback consistently returned ~40 mpg on motorways. 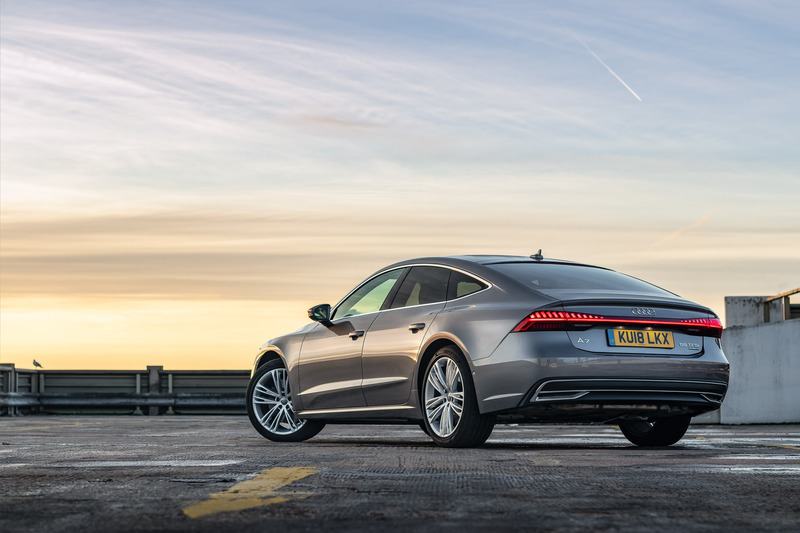 While the prior A7 Sportback ended up being a soft, frivolous long-distance cruiser, Audi has prioritised their efforts on honing the dynamics of the new A7 Sportback. With a lighter, stiffer revised Volkswagen MLBevo platform and optional 4-wheel steering, the work done here is tangible. That said, even with all the work done to it, it’s still tipping the scales at over 1.8-tonnes. 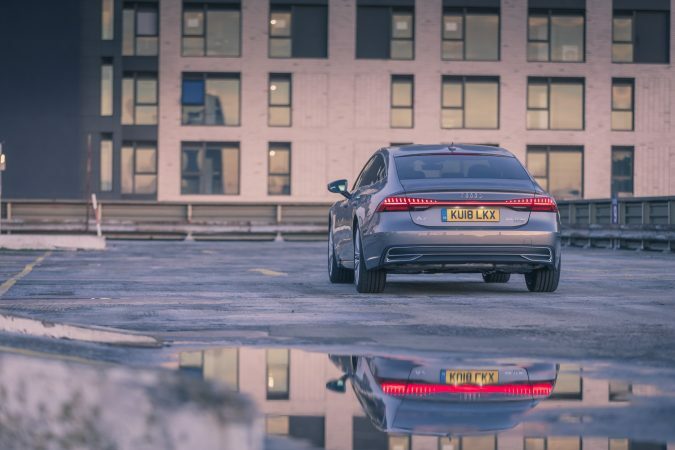 Thankfully, this is where all 620 Nm of its torque comes into play, as the 55 TFSI engine never once felt under-powered lugging along the portly A7 Sportback. Give it a poke and it’ll dart, surging away at a hurried pace. Even with turbochargers, the engine response is prompt, and with minor boost threshold and minimal turbo lag it’s raring to go every time you step on it. 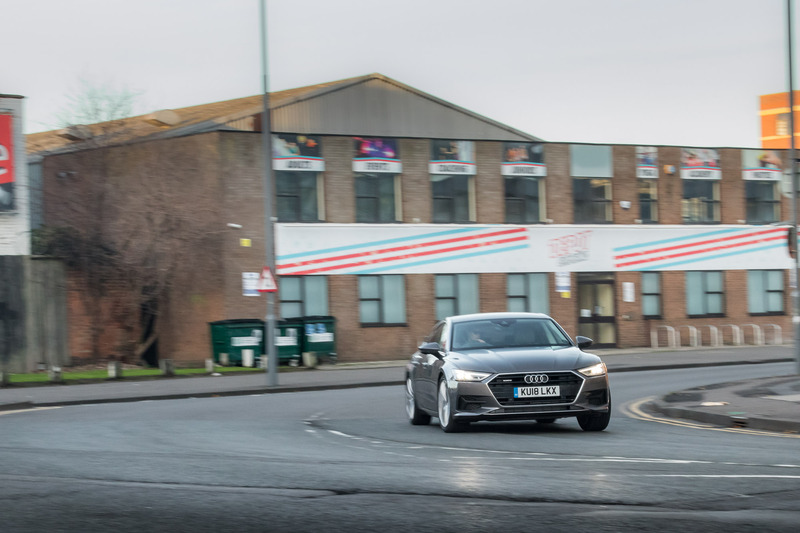 It truly comes into its own when you cruise at a steady speed, thanks to its exemplary refinement. Paired with the superb S tronic dual clutch transmission providing immediate shifting action, the punch is there whenever you need it. Intriguingly, all Audi A7 Sportbacks will also receive Audi’s belt-driven alternator starter 48V mild hybrid system. 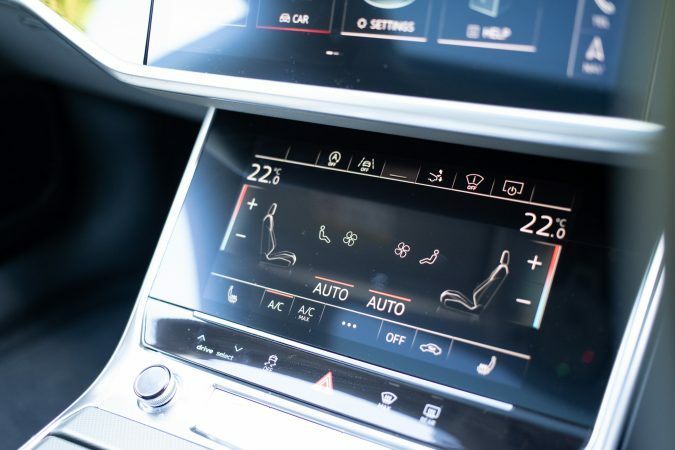 Unlike Mercedes’s rather brilliant ISG mild hybrid system, Audi’s integration is designed for better efficiency instead. 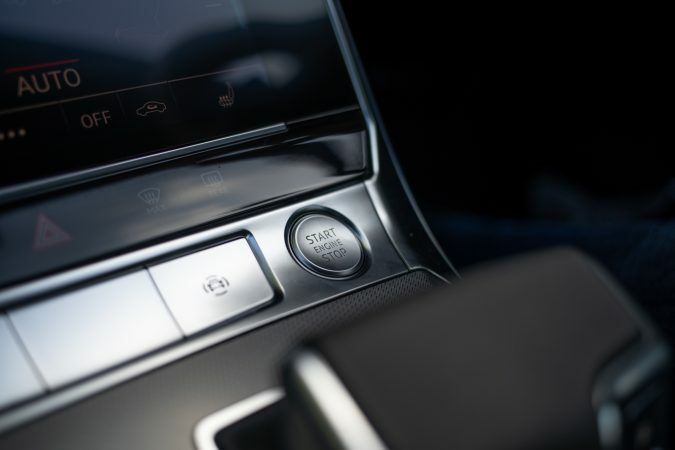 Essentially, it allows the engine to shut off while coasting at speeds between 34 to 99 mph, and allows the start-stop system to function seamlessly. Intriguingly, you do have a range of suspension system to choose from. 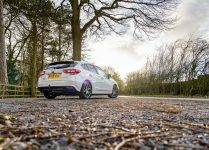 Shelling out £1,150 gets you the typical adaptive suspension, but spend an extra £1,000 over that and you receive air suspension. Ours has the former, though the air suspension is well acclaimed. 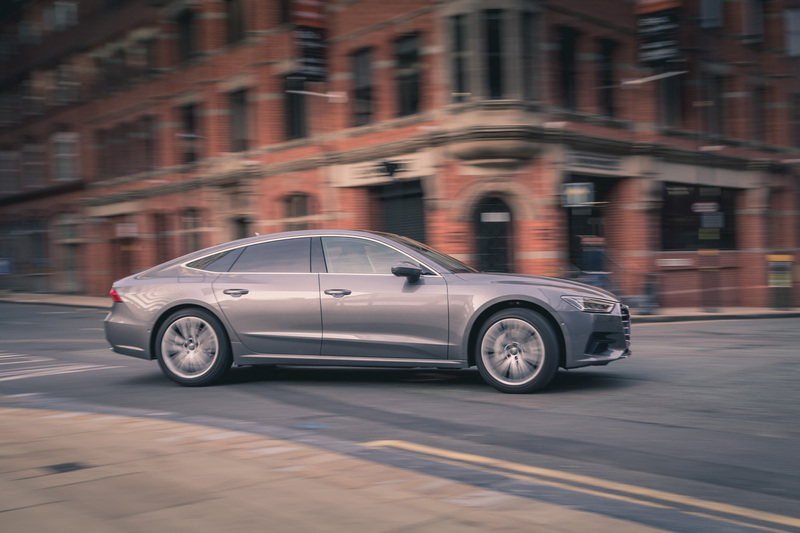 Regardless, it is clear that even with all the contentious ambitions the 2018 Audi A7 Sportback isn’t a B-road natural. 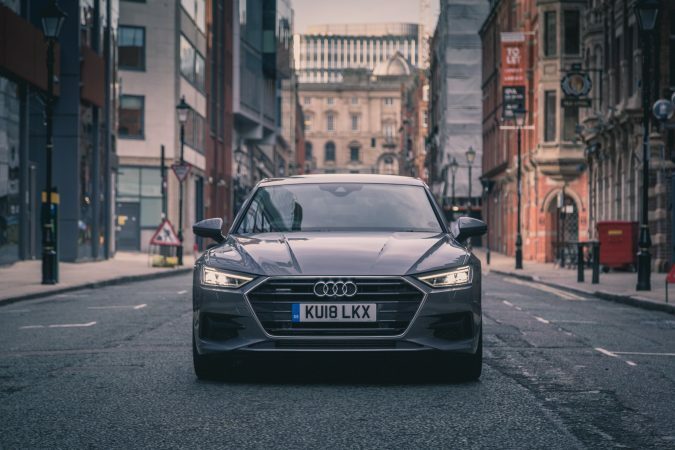 Despite the reassuring steering response and confident handling characteristics with tenacious Quattro grip, the A7 Sportback doesn’t truly belong carving corners and tearing up the road. 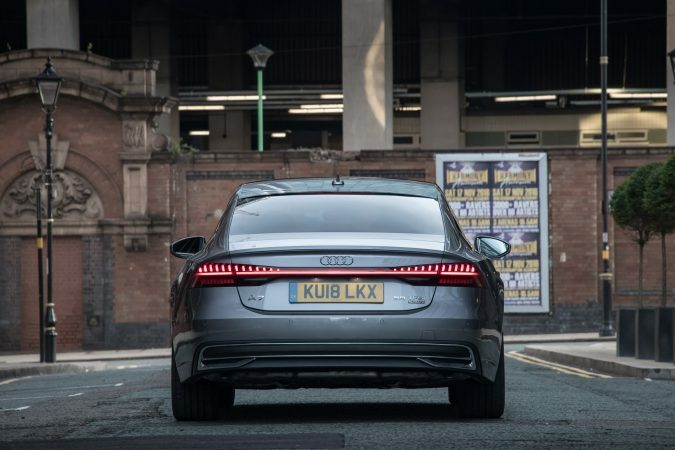 Due to its hefty weight, the A7 Sportback rolls noticeably around corners, and the nose isn’t as communicative as you’d hope. Dynamic mode attempts to cut this down, and while it does help somewhat, a bumpier, more nervous ride results. Stick it into comfort and ease off, however, and the car becomes an impeccable cruiser. It pleasingly glides over bumps and crevasses, settling quickly after what usually would be jarring potholes. 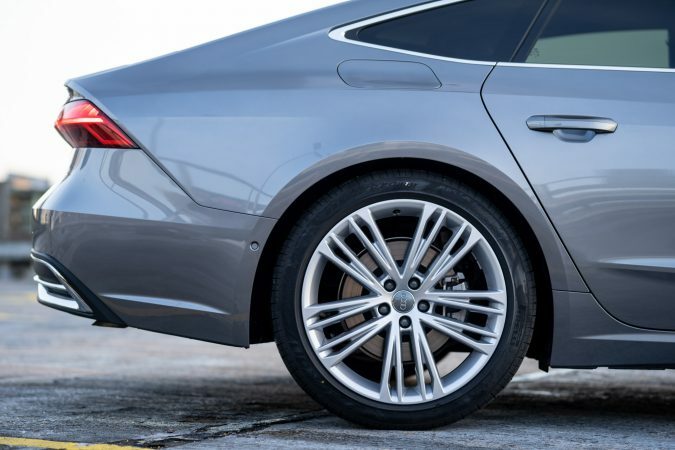 Although if you’re going to keep it in comfort, opting for the reportedly remarkable air suspension may be the way to go. 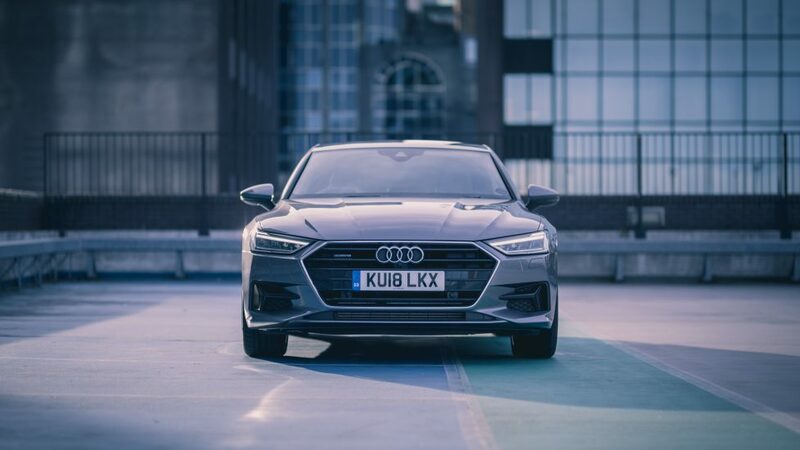 Driving on the motorway, the Audi A7 Sportback offers a markedly hushed ride. In fact, it feels even quieter than the all-new CLS 450. With barely any hint of wind rush or tyre roar, it’s a proper mile cruncher. 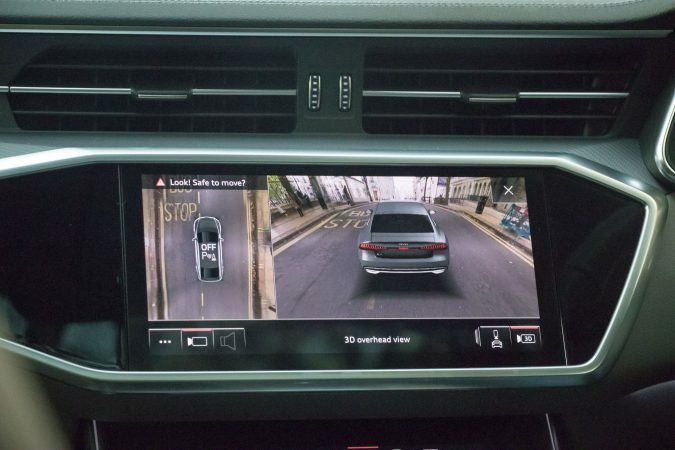 One incredible feature that I loved on the 2018 Audi A7 was the 3D overhead view that you could use for parking and manoeuvring, I’m not 100% sure how useful it is, but it certainly looks the part. 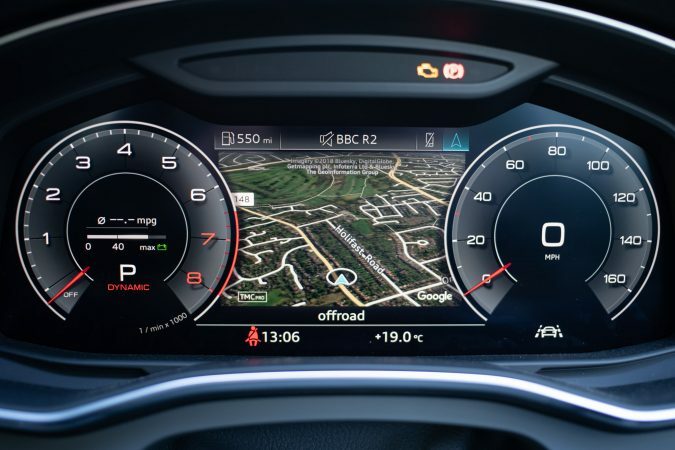 Much like the exterior, the interior of the A7 Sportback is akin to that of a concept car. It’s minimalist, it’s sleek, and for lack of a better term – it’s really rather cool. Leatherette seats are standard, and in our case, its Metropole grey, Valcona leather upholstered wrapped sports seats. And whilst that’s a bit of a mouthful, providing solid bolster support ensures the seats are quite comfortable to sit in even for long journeys. The interior has a very minimalist feel, yet that may be because of Audi’s extensive utilisation of touchscreens in lieu of physical buttons. 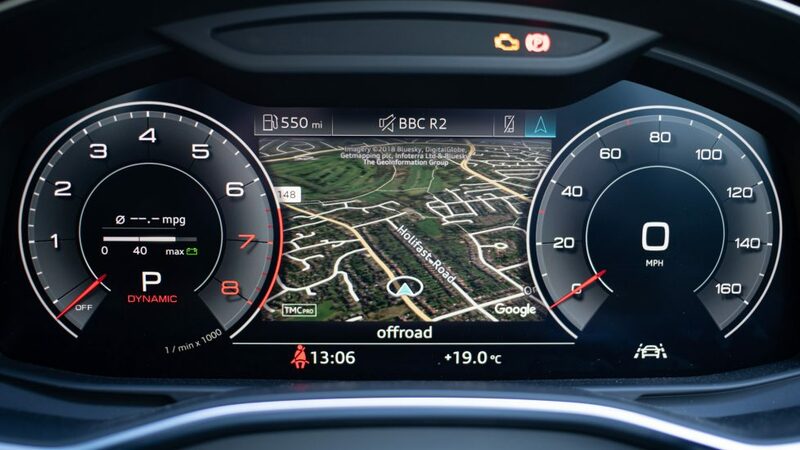 In fact, at the front alone you’ll find 3 massive screens, two being for climate and infotainment systems, while one is the brilliant Audi 12.3″ virtual cockpit instrument cluster. It’s still one of the best systems of its kind. 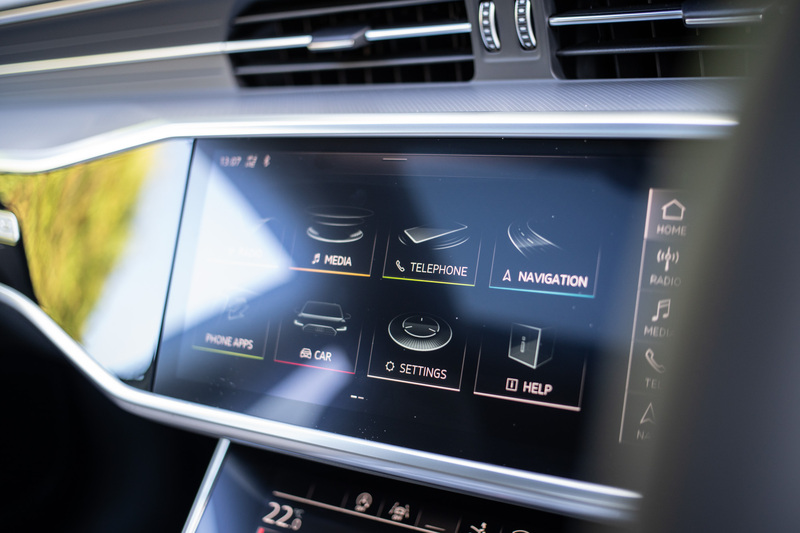 Audi has integrated much of the cabin controls into the two central touchscreens. The one on top serves as the infotainment system, while the one below provides climate control for the cabin. That said, there’s an innate problem with incorporating touchscreen controls in a big car. As the touchscreen is quite far from the driver, it does mean that you’ll have to look at the screen to input commands. 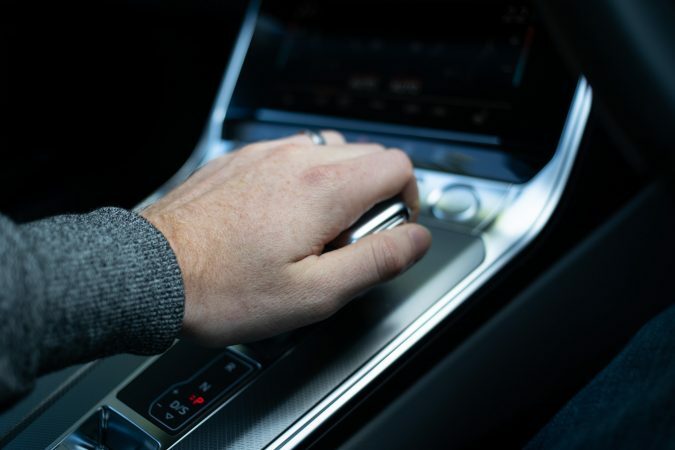 Partially combating this problem, Audi has implemented haptic feedback that at least provides vibrations when you touch the screen and does help as your primary focus needs to be on the road. It is surprisingly roomy at the front, and you can find a decent amount of small item storage littered around the cabin. Move to the back seats and the legroom remains plenty ample. 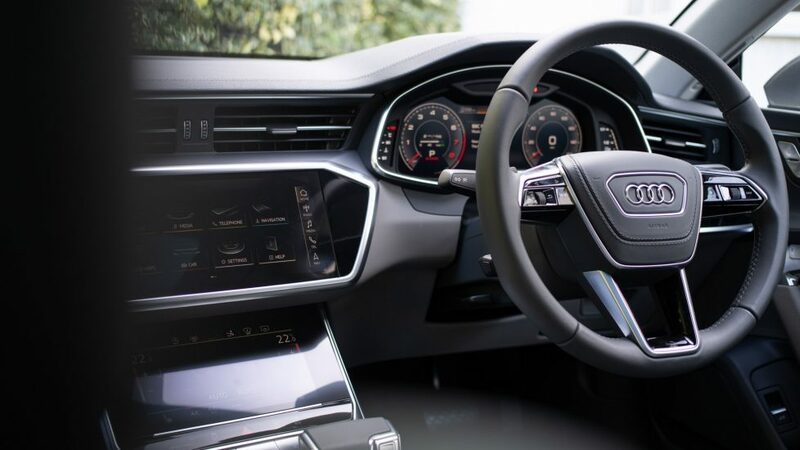 The rear passengers also have a rear climate control touchscreen located on the centre armrest courtesy of the deluxe 4-zone climate control system available at £800. This option is something you may consider, also another note is that the rear windows only wind down halfway. Odd. 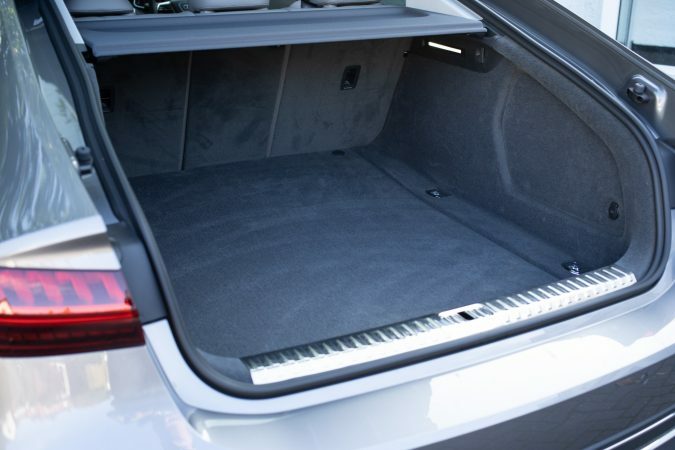 Open up the boot lid though, and you’ll reveal a broad and cavernous cargo section. 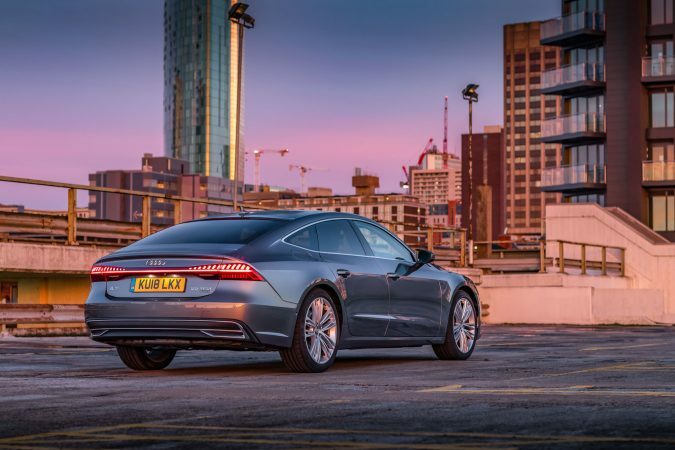 At 535-litres it far surpasses the Porsche Panamera, and even though its comparable to the CLS’s 520-litre, the A7’s opening is far wider. The rear seats also fold in a 40/20/40 fashion for extra versatility. Driving the A7 Sportback was quite the experience. It’s a car that I have admittedly come out yearning for. The interior build quality is superb, it’s a stunning cruiser and it just looks the part roaming around town. There are admittedly some strange quirks. Adaptive cruise control isn’t standard, there’s nowhere to put the rear cargo cover once you unlatch them, and some material choices are somewhat dubious. But other than that, it is a splendid car. Of course, the luxury and superior build quality come at a price. 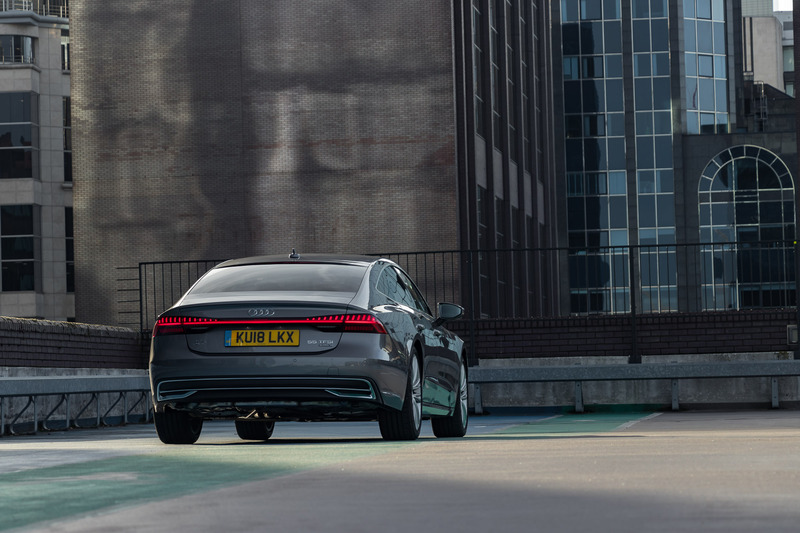 Our A7 Sportback Sport trim comes out at £68,720, and you can end up far north of this in the options list. 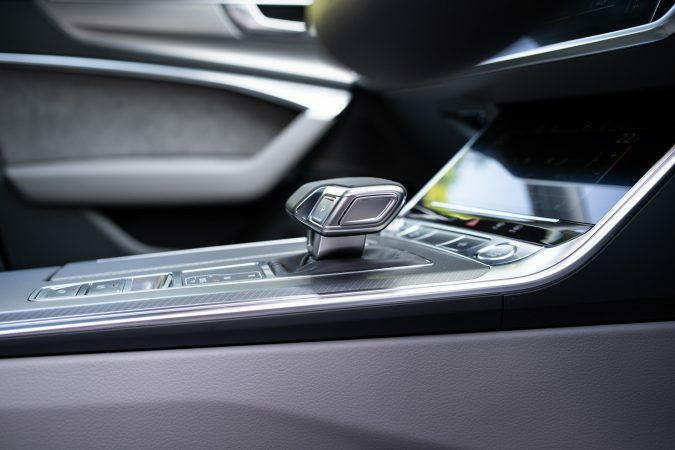 However, even a bog standard A7 with the 40 TDI engine at £46,250 comes with a robust kit of amenities. 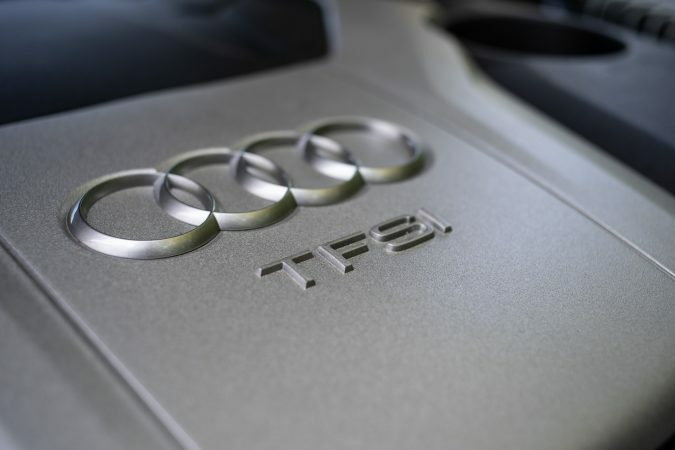 That said, if you’re purchasing one yourself, perhaps opt for the same 55 TFSI engine we have here instead. 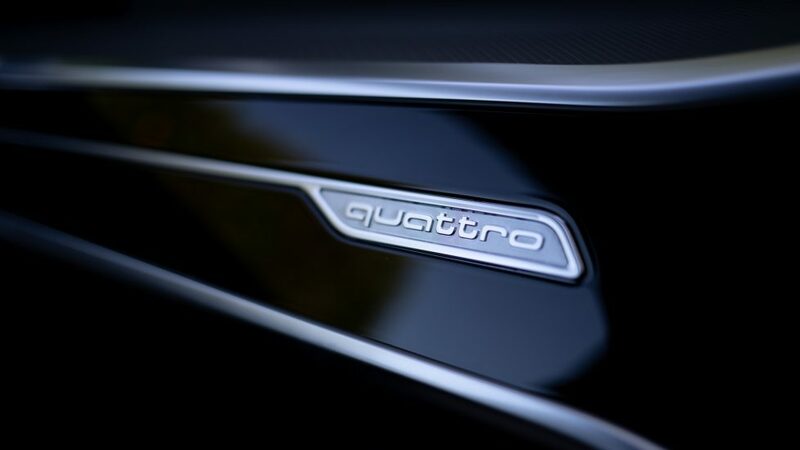 At £53,955 starting price, this engine provides half of the driving experience that a cruising Audi should have. 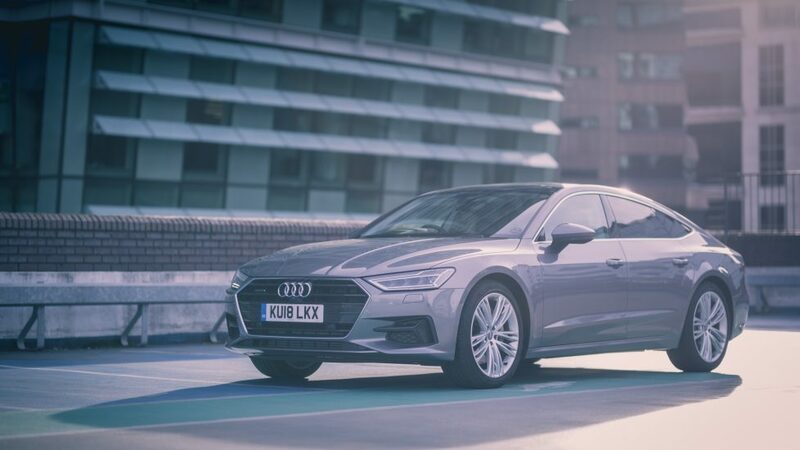 So, is the 2018 Audi A7 Sportback worth the trouble? 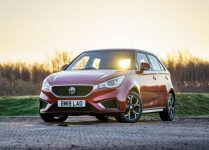 It is a very competent car with a suave coupe styling that’s not only apt at driving and cruising, but also offers exceptional cabin quality and peerless segment practicality. 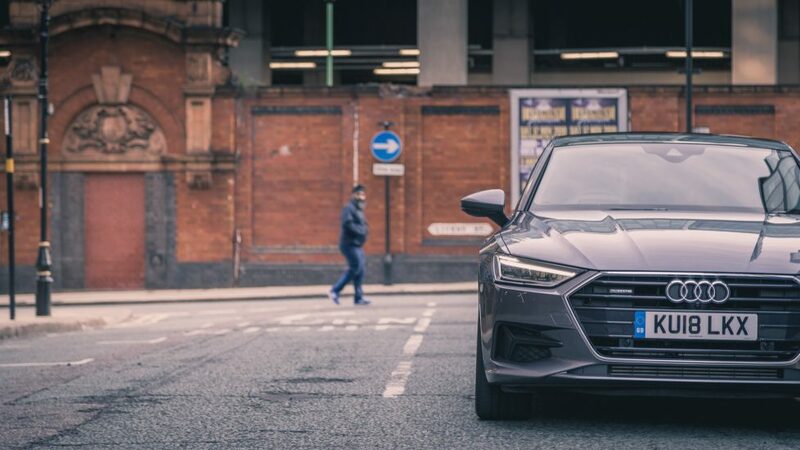 If you want a daily cruiser that won’t mind a bit of B-road every now and then, the A7 Sportback is your pick. However, if you want something with a bit more driving prowess, the Porsche Panamera is peerless. The new CLS 450 with its intriguing engine layout is also worthy of thought. 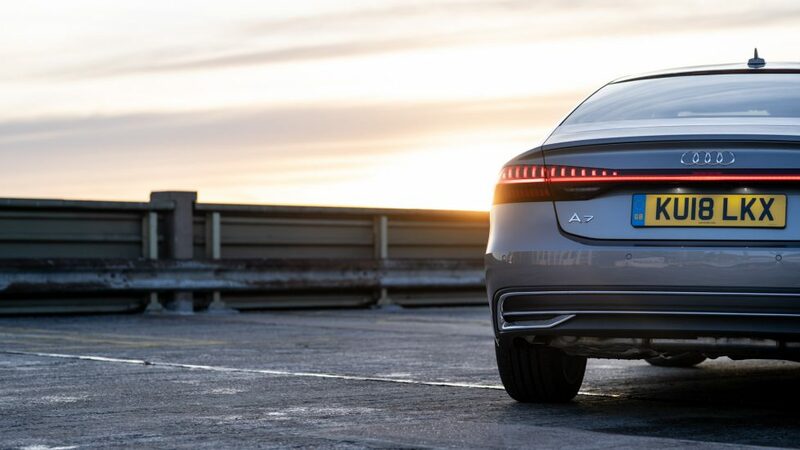 Undoubtedly, the 2018 Audi A7 Sportback is a big leap forward for Audi. It’ll be intriguing to see how they decide to orient their model range in the future, and we can only wait with bated breath.